I love a challenge. Especially if the challenge involves imagination, transformation, giggles, apples and a grocery store. 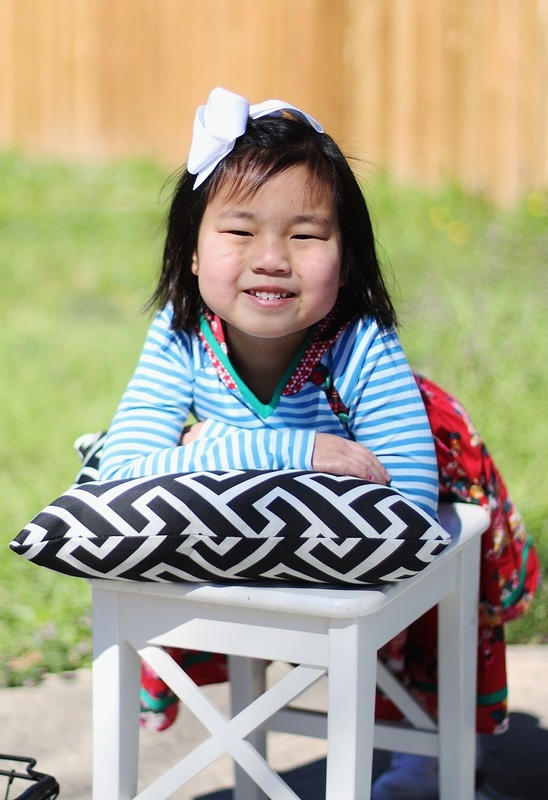 Homes.com asked me to participate in a special challenge for their Crafting for Charity initiative. 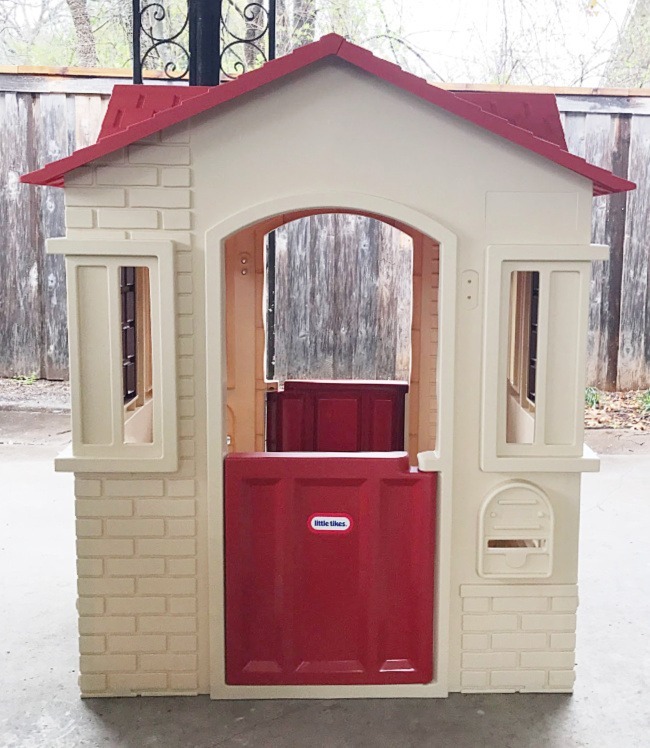 Here’s the basic concept: they sent a tan Little Tikes Cape Cottage Playhouse™ to myself and two other bloggers and asked us all to use our imagination to transform it however we wanted. 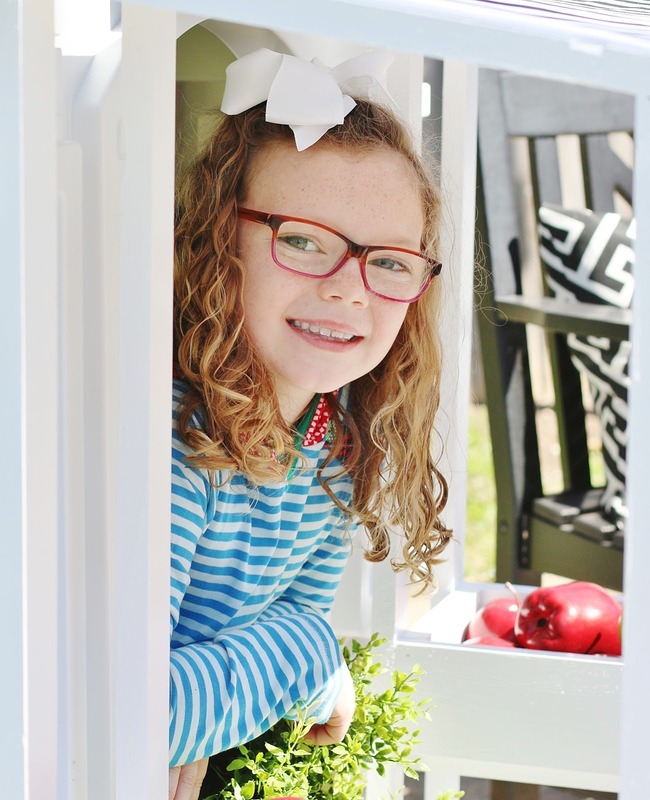 Stay tuned–you all will have the opportunity to vote on your favorite, and the winner gets to donate a cottage (and an additional $750) to their favorite children’s charity. Plus, one random voter will be selected to win a $250 gift card! Here’s where we started. It arrived in a big box with instructions on how to put it together. The roof was red. The shutters were brown. The base of the playhouse was tan. And now? That same playhouse? It looks like this. 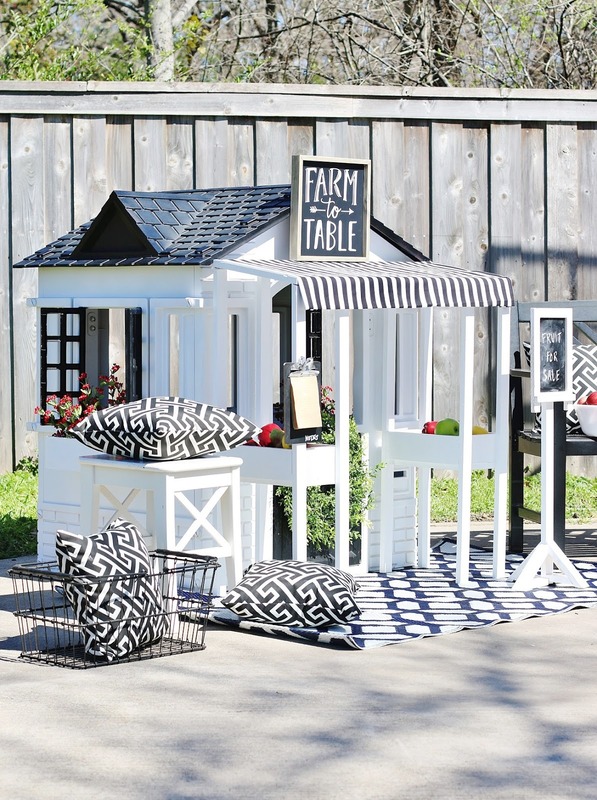 It’s black, white and striped and….. it’s a grocery store! When I was little I had a grocery store just like this that my uncle built it for me. It was black and white with a giant sign that said GROCERY. I’d raid my mother’s pantry to stock the shelves and all my aunts and uncles would stop by and give me 10 cents for a can of green beans. Then, I’d take my money and shop for candy at the little store down the street while my aunts and uncles quietly gave the cans of soup back to my mother. I’d eat my candy, congratulate myself on being an amazing business person, then restock the store so the entire process could start all over again. 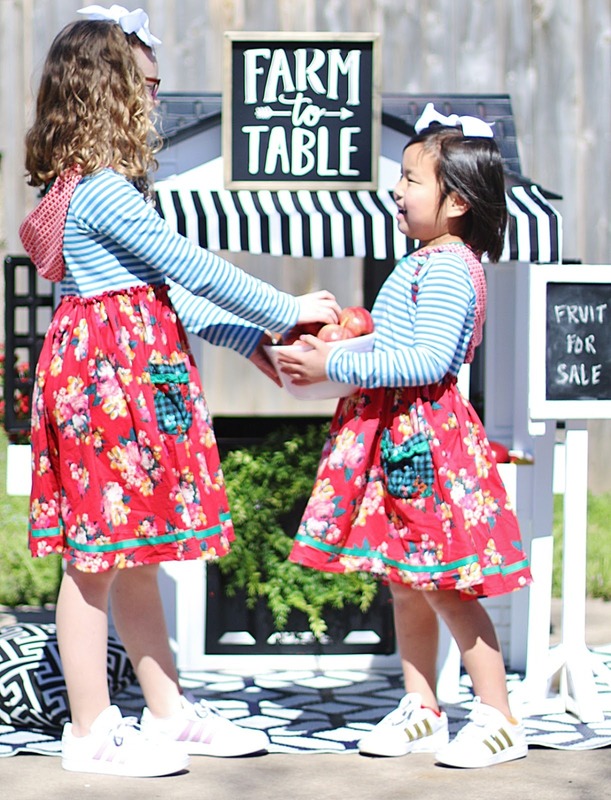 Every young entrepreneur needs a grocery store; this one comes with a fruit stand, order pad, grocery baskets and a chalkboard “For Sale” sign. Oh, yeah–and it’s own tiny grocery door! 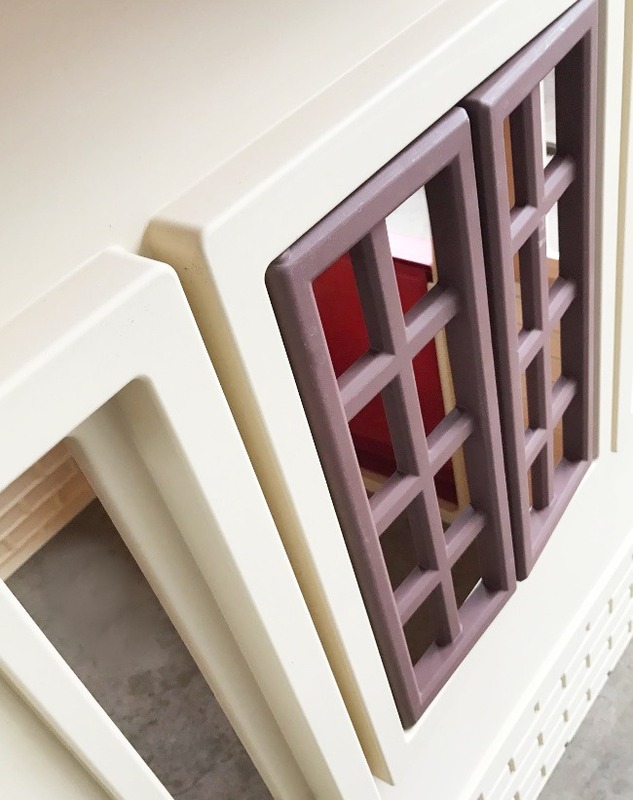 We started by spray painting the entire playhouse using paint specifically designed for plastic. The base was spray painted with white spray paint, along with the doors and roof. We used the same spray paint in black for the shutters. Next, we built a piece that fits onto the front of the playhouse. 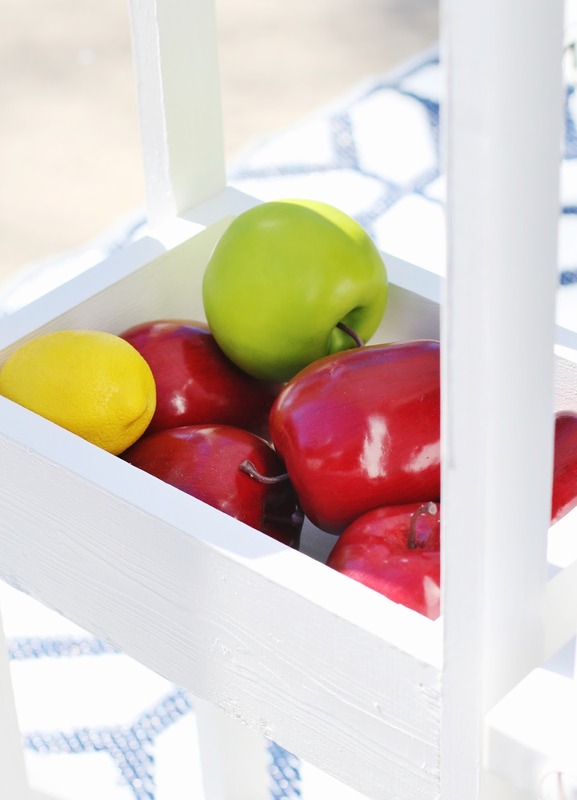 It’s constructed from 1″x 2″s and has a place for produce on either side. The top was constructed with a frame on top to add a black and white awning. 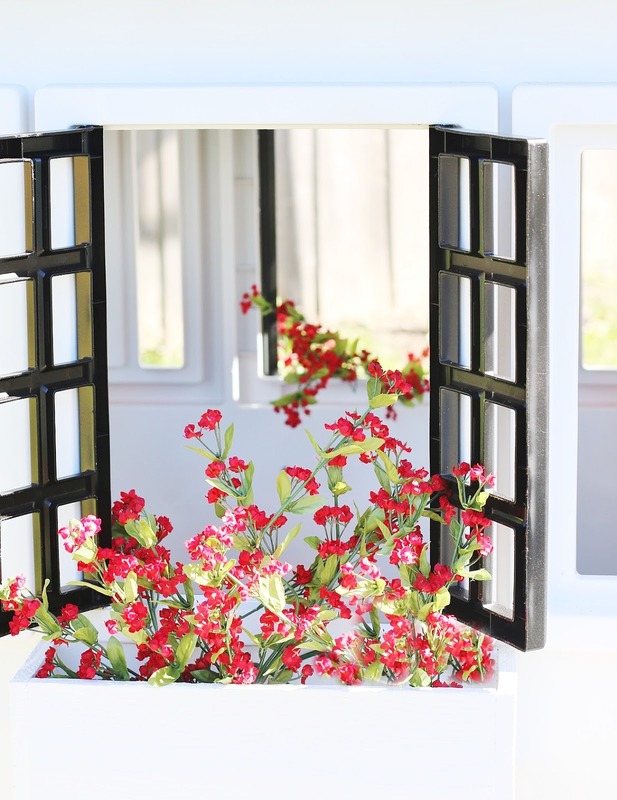 We added window boxes on each side and filled them with flowers. 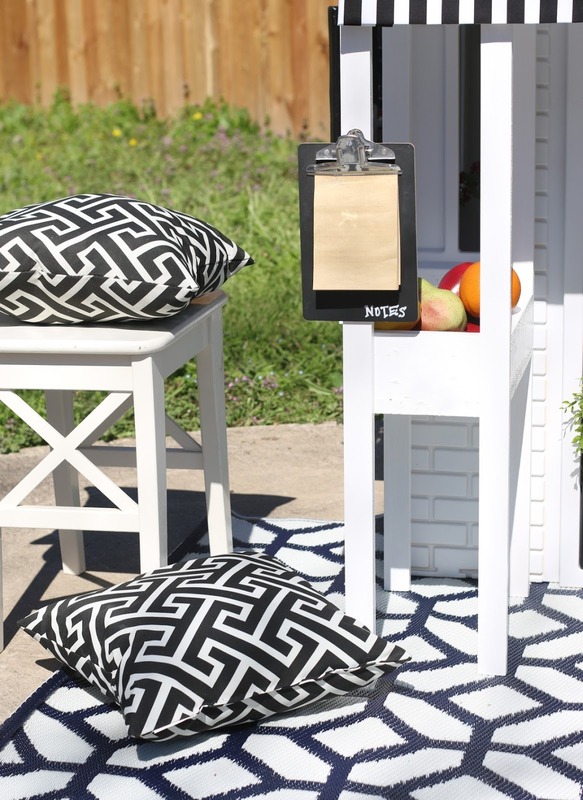 The little black shutters open up and make the perfect place for additional grocery orders. 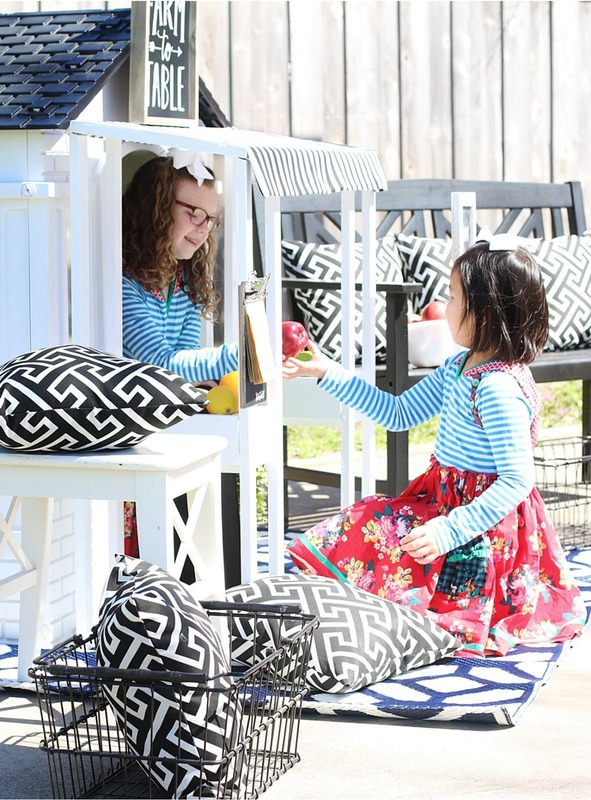 The playhouse was styled with a wreath, an order pad, a welcome mat for customers, a chalkboard sign, and tons of fresh produce ready to order. After it was finished, I invited my sweet nieces over to see how the grocery store worked. I wish you could have heard the giggles and seen all the apple purchases. I’m so happy with how it turned out and how much my nieces love it. …to this after. From my little store to this one, another generation of general managers has entered the building and I’d say it’s a good day to be in the grocery business. KariAnne writes the lifestyle blog, Thistlewood Farm, from the back porch of her turn-of-the-century farmhouse in the beautiful rolling hills of Kentucky. Thistlewood Farm was awarded Country Living Decorating blog of the year as well as named one of the top 10 decorating blogs by Better Homes and Gardens. KariAnne loves to paint mismatched chairs, listen to the crickets singing in the back pasture, walk hand-in-hand with her knight-in-shining armor as the sun sets over the river and drink sweet tea with lime during a thunderstorm. And she has never met a decorating project she didn't like. Okay… well, this is my fave. Love what KariAnne did, but the other two were hard to choose from, as well! Above and beyond! What a creative and amazing transformation! This is way too cool! Love it! I totally love this design, so cute ! Love all the darling makeovers but this one is my favorite. It allows kids to write and imagine. This is the best “out of the box” and “outside the box” creativity. Incorporating an additional idea for the kids to explore and role play is essential to growth. This could be many things to a child with a wild imagination. Ice cream truck/parlor, coffee shop, flower shop, hospital, you name it. Extending the area is brilliant! Excellent idea and end result! Now that’s a competition right up my alley, and I love how your grocery turned out. I’d be there right beside you keeping shop if we were little girls! My favorite – she is so incredibly creative. She always takes everything to the next level. Great job! Love love love this one!! KariAnne is so creative and talented!! Amazing job on this!! #2 gets my vote. Love it. Thanks for your vote, Linda! If you haven’t already, please cast your vote on our official contest page (that is where we will draw the winner’s name from). I pick the Farm to table , black and white. So much fun. I loved playing store as a child. Hi Deby! We love it, too. If you haven’t already, please cast your vote on our official contest page (this is where we’ll be drawing the winner’s name from). Farm to table all the way. Absolutely presh! So cute and clever and chic all at the same time! So creative!! I just love these. I had a playhouse when I was little that was so over the top. My grandfather was a carpenter and built it for my sister and I. We have so many fun memories of that playhouse. #2 – The Grocery Store is just precious! My children would have loved this. 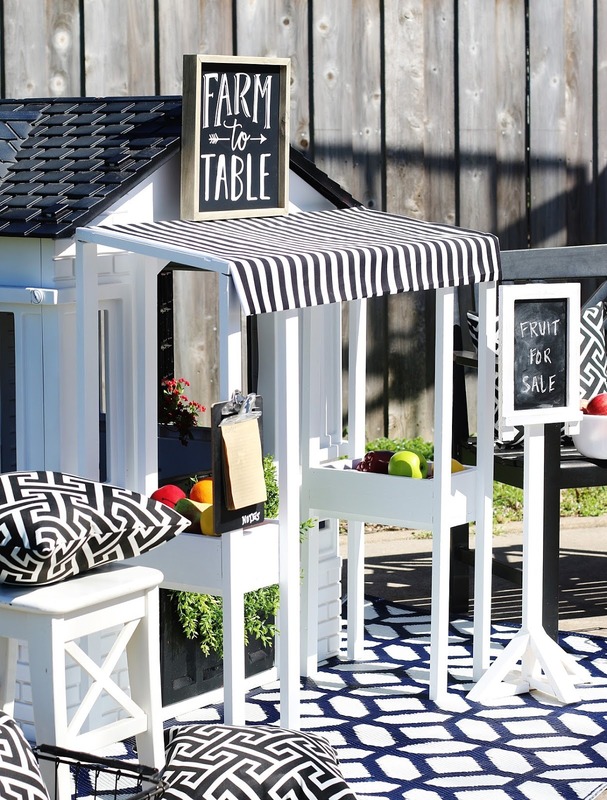 I can just imagine all of the entrepreneurial endeavors that would have occurred in my front yard with this adorable little store – so creative!!! Absoutely Adorable! What a great way for children to use their imaginations!! Whomever is lucky enough to receive this beautiful gift will be blessed with countless hours of joy and laughter! Job Well Done!! 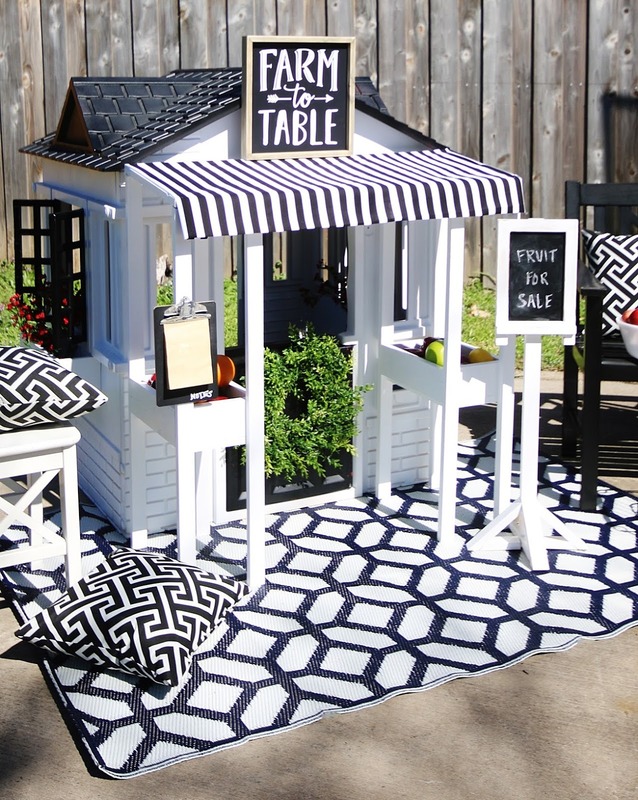 Love this playhouse….can I come over and play? I love the awning and the addition to front door, the bins for fruit display for the store. Just very pleasing to the eye. The other two look great also. Hard to choose. They are all adorable- such amazing detail went into each tiny house. Hard to choose, but I went with Thistlewood’s home because I had that entrepreneurial spirit when I was young and would have loved a little store to sell my stuff! All three ladies did an outstanding job and they are all adorable, but this takes the cake – or even the apples, as the case may be! This is delightful. I imagine your precious nieces had a grand time playing in it. Ughhh, This is so hard! but I’ll have to go with #3. The teal roof and stones are such great details. Really different. #2 would be the runner up because it has a canopy even though the presentation of the veggies/pillows/ rugs are nice the challenge was to recreate the house. Without the other decor it’s just a black and white house. Wow!! This is so dang cute!! 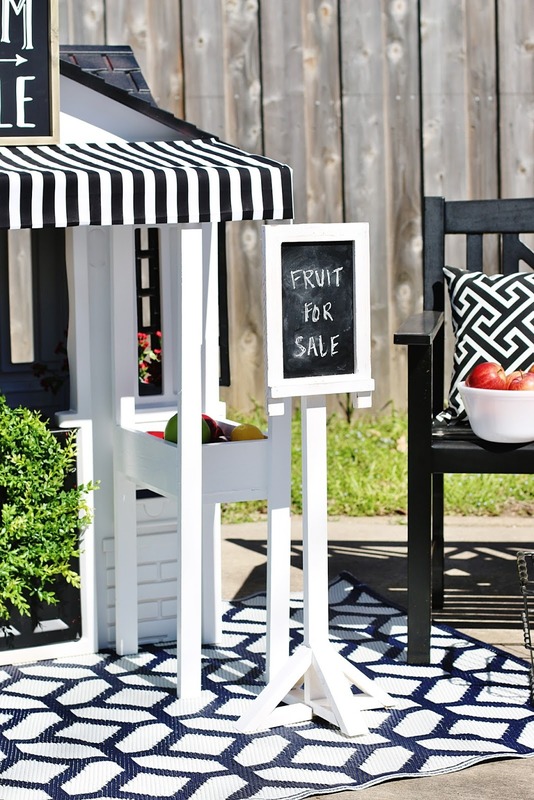 I would shop this fruit stand! They’re all beautiful but this is my favorite. You can tell a lot of love went into creating this. Great job! Oh, no…I missed seeing this contest – today is the first I’ve heard about it.